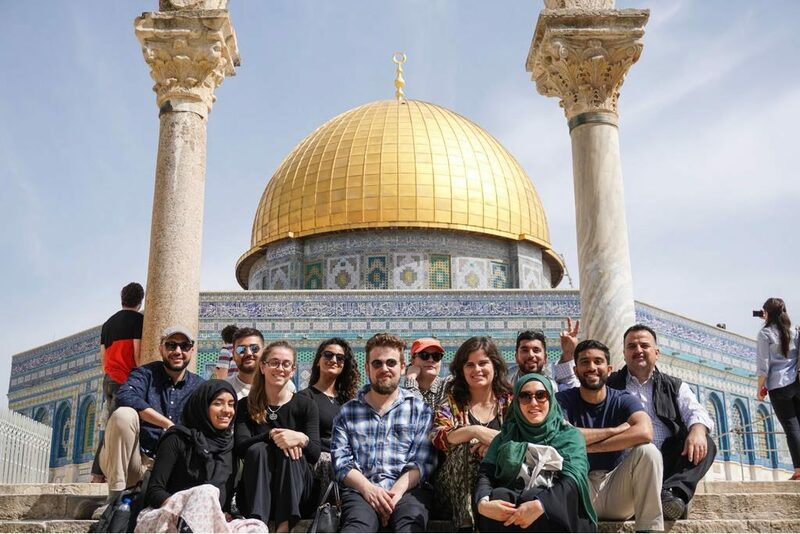 Qasid offers several opportunities for students to absorb Arab culture within a variety of native settings. Beyond the classrooms Qasid creates intimate immersion through events where they will connect with local Bedouin families’ daily lives, learn how to cook local cuisine, assist in farm cultivation, and learn regional customs and traditions such as handicrafts and olive harvesting. We also help expand students’ Arabic language proficiency through better understanding present-day Jordan through interactive workshops, Arab cultural events, and discussions on Jordanian politics, Islam, democracy, media, arts, human rights, the role of refugees, and multiculturalism. We provide each student a rich, visually-compelling series of details through Jordan’s historical sites, including Tracing Islam in Jordan. With Jordan being the site of ancient ruins such as Petra (one of the New Seven Wonders of the World), Ottoman architecture in the town of Salt, or burial sites of religious figures dear to Jewish, Christian, and Islamic traditions, Qasid students never exhaust the possibilities that Jordan has to offer. It is worth noting Jordan’s physical location is referred to in the Qur’an as part of the Sham (or “the Levant”), the Holy Lands where prophets made special prayers and tread its valleys and hilltops. Tombs and shrines of the Prophets and their companions (sahaba) include Harun, Shu’ayb, Dawud, Sulaiman, Nuh, Lut, Yahya, Ayub, Abu Ubaida, Mu’ad Ibn Jabal. Eco-tourism trips are a unique undertaking in Jordan. With a commitment to natural landscape preservation and environmental appreciation— whether it’s hiking through the rolling, mountain terrain of Orgen, enjoying the stunning beauty of the Dana Biosphere Reserve, horseback riding in the Basalt desert, floating on the waters of the lowest point on earth, The Dead Sea, or scuba diving in Aqaba, Qasid encourages its students to take advantage of these opportunities. For those curious to learn more about Jordan, periodic visits to local museums and ancient cultural sites, as well as lectures by invited guests, are organized. We encourage students to explore www.visitjordan.com for a full treatment of what Jordan has to offer. Umm Qais | Roman ruins in the northwestern hills above the Jordan Valley. The site is striking with views of Green Jordan, Golan Heights, and the sea of Galalee. For more information about immersion and travel in the Middle East contact Hani Aljamal at h.aljamal@qasid.com.